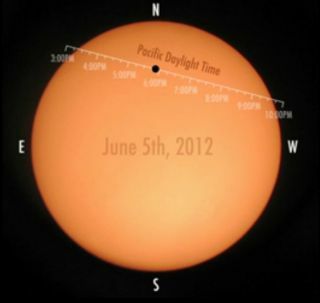 This still from a NASA video shows the position of Venus on the sun's disk in Pacific Daylight Time on June 5, 2012 during the last transit of Venus for 105 years. A once-in-a-lifetime celestial event will take place Tuesday (June 5) when Venus will cross the sun for the last time this century, and astronomers around the world are in position to catch the show. And now you can be, too. You don't have to go to the ends of the Earth to catch the transit of Venus. NASA and many research universities, organizations and amateur astronomy groups are offering their own webcasts of the Venus transit and we here at SPACE.com have assembled many of them below for your convenience. SPACE.com's complete transit of Venus coverage is here. If watching a Venus transit webcast isn't enough, you can search NASA's Transit of Venus page here for a live event near you. NASA is going all out for Tuesday's sky show, with a live webcast of the Venus transit from Mauna Kea, Hawaii. The webcast begins at 5:45 p.m. EDT (2145 GMT), though it will be 11:45 a.m. local time in Hawaii during the broadcast. The online Slooh Space Camera will offer a complete view of the transit of Venus from several different observatories around the world, including telescopes in Australia, Japan, New Zealand, Hawaii, Norway, Arizona and New Mexico. The webcast will begin at 3 p.m. PDT (6 p.m. EDT, 2200 GMT) and include a wide range of expert speakers from astronomy, filmmaking, science reporting and more. The skywatching and astronomy community Astronomers Without Borders will present a live webcast of the Venus transit as it appears from the Mount Wilson Observatory high above Southern California. The webcast will be available here and include interviews with experts, amateur astronomers, video tours of the observatory and a look at vintage telescopes. Astronomers Without Borders President Mike Simmons will host the event. San Francisco's Exploratorium science center will offer a live webcast of the 2012 transit of Venus beamed direction from the Mauna Loa Observatory on the big island of Hawaii. The webcast will behind at 3 p.m. PDT (6 p.m. EDT, 2200 GMT) and include audio commentary every 30 minutes during the program. The Coca-Cola Space Science Center at Columbus State University in Columbus, Ga., will offer a comprehensive webcast of the Venus transit here from observation points in Australia, Mongolia, Utah and at home during the June 5 celestial display. The center's three-country Venus transit webcast is available here, where viewers will be able to see images from Alice Springs, Australia, Mongolia's Gobi Desert and U.S. transit views from Bryce Canyon in Utah and Columbus, Ga. Photos of the skywatching gatherings and images from each site will also be available online. Mount Lemmon SkyCenter, Tucson, Ariz. The University of Arizona's Mt. Lemmon SkyCenter in Tucson, Ariz., is expecting a sold-out crowd during its special Transit of Venus reception on Tuesday. But Tucson skywatchers (and the rest of us, too) can experience the transit view from 9,157 feet (2,791 meters) up atop Mt. Lemmon vicariously via a webcast that begins at 2 p.m. MST (4 p.m. EDT, 2000 GMT). Israel's Bareket Observatory will offer live Venus transit images in a webcast here on June 6 between 5:33 a.m. and 7:56 a.m. Israel local time, which corresponds to 10:33 p.m. EDT June 5 and 12:65 a.m. EDT June 6 (0233 to 0456 GMT). The University of North Dakota's SEMS-Sun Earth Moon Systems program will present a webcast of the 2012 transit of Venus here from Anchorage, Alaska on transit day. The expedition's three-person team includes UND professors Timothy Young (physics) and Ronald Marsh (computer science), and teaching specialist Tricia Young of the University of Minnesota. Chabot Space & Science Center in Oakland, Calif. The Chabot Space & Science Center in Oakland, Calif., will be updating its website with live camera views from a portable telescope at: http://www.chabotspace.org/nellieCam.htm. The department of Astronomy and Meteorology at the University of Barcelona will present a webcast of the Venus transit here live from the Arctic Svalbard archipelago in northern Norway. The webcast will begin on June 6 at 5:33 a.m. to 7:56 a.m. Israel local time, which is about 10:33 p.m. EDT June 5 to 12:56 a.m. EDT on June 6 (0233 to 0456 GMT). Appalachian State University in Boone, N.C.
Appalachian State University will provide live views of the Venus Transit in North America in a live webcast here from its Physics and Astronomy AstroCam Site. The webcast will begin at 6 p.m. EDT (2200 GMT) and end at 8 p.m. EDT (0000 GMT). Eight solar telescopes with filters will be available on site for observers at the university's Rankin Science Observatory. The Planet Hunters project, a cooperative effort by Yale University and the citizen science project Zooniverse, will present a live Venus transit webcast here with live views from Tromsø, Norway; Sapporo, Japan; and Carins, Australia. Live commentary will be provided in English and Spanish. You can follow SPACE.com Managing Editor Tariq Malik on Twitter @tariqjmalik. Follow SPACE.com for the latest in space science and exploration news on Twitter @Spacedotcom. We're also on Facebook & Google+.